Objective This study aimed to build an understanding of how the process of singing impacts on those who are affected by cancer, including patients, staff, carers and those who have been bereaved. Design A qualitative study, informed by a grounded theory approach. Setting and participants Patients with cancer, staff, carers and bereaved who had participated for a minimum of 6 weeks in one of two choirs for people affected by cancer. Methods 31 participants took part in Focus Group Interviews lasting between 45 min and an hour, and 1 participant had a face-to-face interview. Findings Four overarching themes emerged from the iterative analysis procedure. The overarching themes were: building resilience, social support, psychological dimensions and process issues. Following further analyses, a theoretical model was created to depict how building resilience underpins the findings. Conclusion Group singing may be a suitable intervention for building resilience in those affected by cancer via an interaction between the experience and impact of the choir. This is the first grounded theory study to have been conducted to explore the impact of group singing for those affected by cancer. Thirty-two participants took part spanning patients, staff, carers and bereaved, and saturation was reached. This study was concerned with people affected by any type of cancer, but it remains for future studies to establish whether singing has a specific bespoke impact for people with different types of cancer. This study used focus group and one-to-one interviews to provide in-depth data to understand shared perspectives and individual experiences, but as no participant observations were undertaken, the behaviours of participants during the singing sessions themselves remain unstudied. However, despite these few promising studies which suggest that group singing is a valuable support, there has been no attempt to build an evidence base regarding why singing may be beneficial for those affected by cancer. One previous study proposed that the main mechanism by which singing can affect quality of life in those affected by cancer is that it provides an uplifting musical experience within a supportive community context,13 but this remains to be explored further. This research gap has been recognised more broadly in the context of other music interventions within health contexts, for example, by DeNora and Ansdell,17 who state that current research cannot describe the processes by which music effects change. Therefore, the aim of this study is to address this gap in the literature and to build an understanding of how the process of group singing impacts on those affected by cancer, including patients, staff, carers and those who have been bereaved. A qualitative methodological approach informed by grounded theory was adopted. This systematic strategy entailed an iterative process of analysing data after each data collection period and constantly comparing data with data. This process allowed a theory of singing and cancer to emerge that was grounded in the data 18 as each emergent theme was inductively explored and adapted until the end of data collection when saturation had been reached.19 Focus group interviews were chosen as the primary method as the research question demanded an understanding of group singing and therefore shared perspectives. This study was part of a larger 2-year non-randomised controlled investigation into singing for people affected by cancer. There were three cohorts recruited: (1) cohort A: patients with stage I–III breast or colorectal cancer up to 24 months postdiagnosis, as well as patients with prostate cancer on active surveillance; (2) cohort B: hospital staff, people who cared for someone with cancer and those who had lost a family member or somebody they cared for to cancer in the last 3 years and (3) cohort C: anybody who had been affected by cancer who wanted to sing in a choir. No musical experience was required to join any of the cohorts, but participants could not also be singing in another choir and join the research. The study was approved by the NHS Research Ethics Service, and participants consented for anonymised data to be used and analysed by the research team. Participants from all three cohorts were invited to join one of two choirs (based on geographical location) or to be assigned to a ‘care as usual’ group. Joining the choir involved weekly singing sessions of 60 min preceded by 30 min of socialising and refreshments for a period of up to 24 weeks. The choirs are led by professional choir leaders and the singing typically starts with a short warmup lasting 5–15 min, with the rest of the rehearsal being used to practice contemporary popular music songs. There is no sheet music and no musical experience required, and everyone reads from lyric sheets denoting the choral parts. For this substudy, participants who had consented to the larger study and joined the choirs were invited to take part. In accordance with grounded theory, the sample selection after the first group was guided by the data collection: the first focus group was conducted with a mixture of patients and non-patients but to explore whether the themes occurred with patients-only and with non-patients only, two further respective focus groups were held. We invited people to take part in the study if they had been to at least six choir rehearsals and were still a member of the choir at the time the study was being conducted (August–October 2017). This totalled 54 eligible individuals who were invited, of whom 32 took part (see table 1 for participant demographics). This study was carried out as part of a larger 2-year grant looking at singing for people affected by cancer. Patients with cancer, carers and staff took part in focus groups to design the research questions at the start of the grant and approved all study designs and measures. Patients and public also actively took part in recruitment for the study and have helped to disseminate results from other completed phases of the grant. Data collection involved three focus group interviews (n=31) held at the site of the choir rehearsals over a 10-week period (August–October 2017) where open questions were asked about the experience of singing in the choir. The first group consisted of patients with cancer and non-patients (staff, carers and bereaved), the second of non-patients only (staff, carers and bereaved) and the third of patients only (current patients and survivors). One participant did not want to contribute to a focus group interview, but did want to participate in the research so had a one-to-one interview. The interviews were all audio-recorded and then transcribed verbatim by a member of the research team. Four overarching themes and 16 subthemes emerged from the analysis procedure (table 2). The choir was viewed as a medium to bring people together which seemed to support living with cancer, in addition to helping with ‘rehabilitation’ (participant from focus group 1). The choir was also seen to help coping with specific challenges associated with cancer such as isolation, vulnerability, stress, tiredness, uncertainty and dealing with bereavement. Furthermore, participants reported that there was something particular about singing which supported coping, for example, participants mentioned that there was ‘something about the words’ which are ‘inspiring’, ‘feeling the harmonies’ and ‘growing with the music’ (participants from focus group 1). As a specific coping tool, participants discussed hearing the songs in their head throughout the week, with one participant describing this as ‘a song in my heart’ (participant from focus group 3). It seems then that the songs are a resource for these participants to drawn on throughout the week between rehearsals. Nevertheless, there was one report of an ‘earworm’ which had negative connotations, where a warmup song was described as an ‘awful song’ (participant from focus group 3). It seemed the choir gave confidence to participants in a number of ways, including defying negative associations of singing from childhood, giving general confidence and empowering participants at a time where confidence had been lost due to being affected by cancer. Other examples included gardening, yoga, making others laugh and singing to grandchildren (participants from focus groups 1 and 3). Thus, it seems that the effects of the choir went beyond the rehearsal room and affected participants’ lives throughout the week, including encouraging positive behavioural change. Participants also commented on the empathy that they have for one another (participant from focus groups 2 and 3), in addition to noting that the ‘unspoken support’ (participant from focus groups 1 and 2) differed from traditional help, such as support groups. It was also suggested that due to the commonality of the cancer journey and this shared choir context, people felt equal. One nurse commented on ‘seeing everyone come together’ (participant from focus group 1), another member of hospital staff said that the choir was ‘a good place for me to be’ (participant from focus group 1), and another participant said that it was for anyone, including those who ‘work in healthcare’ (participant from focus group 3). Accordingly, there was a recognition and appreciation among choristers that the choir is open to all. This group identity is maintained despite the fact that it is ever changing; members come and go, people’s lives change and it is constantly developing. There is a dichotomy between the choir as something fleeting ‘in the moment’ (participant from focus group 1) and the idea that members are ‘part of something’ as if it had permanence (participant from focus group 3). It is this combination of growing with the choir while feeling a member of it that results in this organic feature to the experience—even though it changes, there is still a sense of group support. Characteristic of all of the themes in this category and further illustrating this organic quality, there was a moment in the third focus group where members were discussing songs that they would like to sing and they all started singing ‘Gaudete’ together, a song that they had never learnt as a group. This spontaneity shows that there is a dynamism to the group where they can adapt and work together. This emotional experience therefore had a cathartic quality, providing psychological relief whereby participants could ‘just express’ themselves (participant from focus group 3) and ‘let go’ (participants from focus groups 1 and 3). Participants were completely immersed in the activity of group singing, resulting in ‘a kind of mindfulness’ (participant from focus group 1). Complementing this catharsis, the choir was coined a positive experience (subtheme 3.2) with particular emphasis on it being ‘uplifting’, which was mentioned in all of the focus groups. The positive aspect of the choir was also connected to idea that the choir was fun, enjoyable and a ‘happy’ experience (participant from focus group 1). It’s physical and like you said about the breathing, its physical and its mental and it’s emotional (participant from focus group 1). Participants also saw the choir as a chance for ‘me time’ (participant from focus group 2), where the members could have time to just be themselves, rather than be characterised by the experience of living with cancer. The choir leader was viewed as an anchor, holding everybody together, sustaining the energy of the experience and someone to look up to, and to learn from. However, there were suggestions that there could be more classical music in one of the focus groups (3), and there were mixed responses to one particularly emotional song that explicitly discussed facing up to cancer. Following initial analyses of the data to produce the themes described, the researchers sought to unpack the qualitative mechanisms of the theme ‘building resilience’, which seemed to underpin all of the findings. A key part of this process was to explore the categories that had been created alongside raw data and researcher memos. Two of the researchers (TW and KW) employed diagramming, comparing and integrating through drawing out thematic maps which prompted an abstract level of analysis.20 New relationships formed from within the data and memos, which allowed for reflection on structural elements, such as micro-level (individual) and macro-level (contextual/environmental) features, which were then discussed in light of quotes from the raw data. This interpretative theorising allowed the team to abstract a theory of perceived resilience created out of a dynamic interaction between the experience of the choir—influenced by past experiences of singing from childhood, environment and personal traits—and the impact of it, such as musical skills, confidence and enhanced well-being (figure 1). As a qualitative model grounded in the interconnection of data and theory, it is not possible to stipulate which factors are essential and which are peripheral to building resilience, but this model shows that there are a multiplicity of elements involved and that a combination of them resulted in enhanced, subjective resilience for the participants who took part in this study. 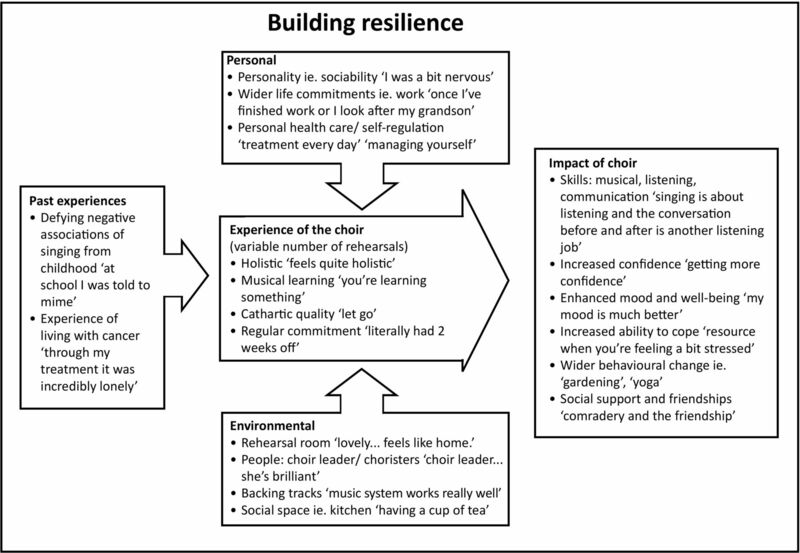 Theory of building resilience, showing that the perceived resilience created by the choir is underpinned by the interaction of the experience of the choir and the impact of it. The aim of this study was to build an understanding of how the process of group singing impacts on those affected by cancer. Results revealed four overarching themes (building resilience for those affected by cancer, social support, psychological dimensions and process issues), with further analysis enabling the creation of a model presenting how building resilience underpinned the findings. There were no noticeable differences in themes across the different focus groups, suggesting that these findings are relevant for patients, staff, carers and bereaved. This is also the first known study to provide a model for resilience, highlighting the mechanisms by which singing impacts on those affected by cancer. With this understanding of resilience in mind, the findings of this study support group singing as an important intervention to build resilience in those affected by cancer. Group singing was seen to improve self-confidence, transcend the cancer experience through immersion in the activity and improve self-esteem through acquisition of musical skills via a balance of challenge and fun. One of the key reasons that the choir could achieve this was also through its specifically social nature. Community support can be harnessed for resilience, assisting in developing individual psychological and community strengths.22 25 The choir made social connections through a group context where a fellowship among members was created. All of these elements are shown in the suggested model for building resilience. The findings of this study also reinforce other theories concerning psychosocial needs. Lutgendorf et al 26 put forward a three-factor model to suggest that social support, emotional expression and benefit finding can aid those affected by cancer, including supporting strong immune response. Choristers expressed emotions in a ‘good way’, attained social support through new friendships and an inclusive environment, and they found some form of benefit from their experiences through learning new skills, enhanced confidence and the enjoyable experience of singing together. Consequently, the present study suggests that these three factors can contribute to positive adjustment, including promoting resilience. There are also indications that the results of this study resonate with theories of well-being. The results from this study suggest that the choir might be able to fulfil the three basic psychological needs of relatedness, competence and autonomy.27 First, the participants commented on the group and social aspects of the choir. The choir also gave a fulfilling experience—offering a sense of achievement by learning songs together—which could satisfy the need for competence. This is also supported by previous studies.12 15 Members were also autonomous as they chose to come to choir each week, integrated the activity into their lives and were self-regulated in their attitude to learning. More generally, this study links to concepts of enhanced well-being. In addition to supporting the components of increased quality of life in previous studies,12 15 it also correlates with notions of hedonic and eudaimonic well-being.28 Happiness and satisfaction can be seen in themes relating to positive experiences, and psychological functioning and self-realisation are inherent in building resilience and psychological dimensions. This supports previous research which has shown that instrumental learning in adulthood can provide both immediate (hedonic) and long-term (eudaimonic) enhancements to subjective well-being,29 suggesting that there might be shared mechanisms of music across different musical experiences. As a qualitative methodology pursuing emergent analytic goals, it is not possible to make generalisations based on this study; however, the insights gained may support the development of future interventions.18 By breaking down the elements of how choir singing may support building resilience, it may be possible for future quantitative studies to test which of these features form the constitutive elements of resilience and which are incidental. Attaining this understanding may allow for optimisation of benefits from choral singing, understanding better the relationship between singing and resilience for those affected by cancer. Another future avenue could be to conduct an ethnography to understand the contribution of the sociocultural context to this theory of building resilience. A limitation of this study is that it has not been able to reflect on shared patterns of behaviours and values which would enable further reflection on whether cultural components are related to health outcomes. There is a need to identify interventions which will provide psychosocial support for those affected by cancer, including patients, staff, carers and bereaved. This study has shown that group singing may be a suitable intervention, building resilience in those affected via an interaction between the holistic experience and impact of the choir context. The authors wish to thank Tenovus Cancer Care, the Royal Marsden NHS Foundation Trust and the choir members who took part in the study, in addition to Saoirse Finn who supported transcription. The authors also wish to acknowledge The Royal Marsden Cancer Charity who funded TW’s time and the infrastructure support of the Royal Marsden/Institute of Cancer Research Biomedical Research Centre.
. The psychosocial needs of cancer patients: National Academies Press, 2008. Council I of M and NR. From cancer patient to cancer survivor: lost in transition, 2005. Macmillan Cancer Care. “It’s no life” Living with the long-term effects of cancer. 2009.
. Constructing grounded theory: Sage, 2014:388.
. Basics of qualitative research : techniques and procedures for developing grounded theory: Sage, 2015:431.
. Constructing grounded theory: SAGE, 2006:224.
. An integrated model for understanding and developing resilience in the face of adverse events. J Pacific Rim Psychol 2017;3:20–6.
. Disaster resilience: an integrated approach: Charles C Thomas, 2006:321.
. Psychosocial influences in oncology: an expanded model of biobehavioral mechanisms. In: Ader R , ed. Psychoneuroimmunology. 4th edn. Burlington: Academic Press, 2007:869–95.
. Religions, values, and peak-experiences. Ohio: Ohio State University Press, 1964.
. Music and mind in everyday life: Oxford University Press, 2010:1–68.
. “To be heard”: The social and mental health benefits of choir singing for disadvantaged adults. Psychol Music 2012;41:405–21.
. The perceived benefits of singing: findings from preliminary surveys of a university college choral society. J R Soc Promot Health 2001;121:248–56.
. Creativity and spirituality: bonds between art and religion: State University of New York Press, 1998:82. (cited 12 Dec 2017). Contributors The research team collaboratively designed the study. TW and DF led on the supervision of the project. KW led on the data collection with support and guidance from DF and TW. TW and KW conducted independent analysis which was discussed at team meetings, resulting in the creation of the model presented, drawn by KW. KW produced the draft of the report which was refined following detailed input from TW and DF. Funding This research was funded by Tenovus Cancer Care with additional support from the Arts and Humanities Research Council [AH/P005888/1]. Ethics approval The NHS Research Ethics Service approved the study. Data sharing statement The data used in this research were collected subject to the informed consent of the participants. Unfortunately, the dataset is not publicly available as participants only consented to the research team having access to the raw dataset. Correction notice Since this paper was first published online the open access licence has been changed from CC-BY-NC to CC-BY.